Corsa Exhaust 468646. Featuring Donaldson PowerCore Filtration Technology, CORSA air filters are warrantied up to 100,000 miles, flow better than traditional cellulose or cotton fiber filters and filter up to 99.99 Percent of engine damaging dirt, dust and debris. Corsa Exhaust 415864. Cold Air Intake; Pro-5; Black Plastic Tube; Blue Pro5 ® Air Filter; With Air Box. Featuring Pro-5 Filtration Technology, CORSA air filters are warrantied for 1 year, unlimited miles. Corsa Exhaust 463576. Cold Air Intake; PowerCore (R); Black Polyethylene Tube; Blue Filter; With PowerCore Closed Box. 2011-2016 Chrysler 300 C V8.-cc Air Intake Systems::Cold Air Intakes. 2014 Chrysler 300 C Luxury V8.-cc Air Intake Systems::Cold Air Intakes. Corsa Exhaust 4415062. Featuring Donaldson PowerCore Filtration Technology, CORSA air filters are warrantied up to 100,000 miles, flow better than traditional cellulose or cotton fiber filters and filter up to 99.99 Percent of engine damaging dirt, dust and debris. 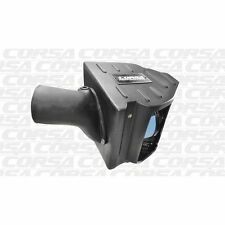 Closed Box Plastic Black Cold Air Intake System with Pro5 Filter (45860151) by Corsa®. Filter Box is engineered to minimize hot air from entering the engine in order to increase HP. System Type: Cold Air Intakes. Each MaxFlow 5 Filter Is System-Matched to CORSA Performance Intake Components For Maximum Gains. - Features CORSA's MaxFlow 5 High Performance 5 layer, Oiled Cotton-Gauze Air Filter. Max Flow 5 Part #5161Reusable Oiled Filter Part # 5161. This Corsa Exhaust Cold Air Intake uses a black plastic tube and blue Pro 5 air filter. Pro5 Closed Box Air Intake System; For Use w/Filter PN;. 100% Genuine Corsa Performance. Our Filter Box is engineered to minimize hot air from entering the engine in order to increase HP. Silicone connectors provide flexibility while still maintaining strength and thermal stability. This CORSA Performance Pro5 closed box air intake is designed for 2015-17 Mustang 5.0 GT models. Featuring Pro-5 Filtration Technology, CORSA air filters are warrantied for 1 year, unlimited miles. CORSA air intakes are proudly designed, engineered and manufactured in the USA. Our air intakes use the Donaldson(R) PowerCore(R) Filter to improve performance and significantly decreased filter maintenance. The PowerCore(R) filter optimize engine performance by directing air through specifically designed channels that allow clean air to efficiently enter the engine. 2015-2016 F-150 3.5L Ecoboost. 2016-2018 F-150 2.7L Ecoboost. 2011-2013 Dodge Challenger SRT-8, 6.4L V8 Filter #61503 CARB 2011-15 PowerCore Filtration Technology uses advanced technology for improved efficiency. Manufactured by Donaldson, the filter optimizes engine performance by directing air through specifically designed channels that allow clean air to efficiently enter the engine. Part #: 463576. Our air intakes use the Donaldson(R) PowerCore(R) Filter to improve performance and significantly decreased filter maintenance. The PowerCore(R) filter optimize engine performance by directing air through specifically designed channels that allow clean air to efficiently enter the engine. Pro5 Closed Box Air Intake System. Pro5 Closed Box Air Intake System; For Use w/Filter PN;. Automotive products at CORSA Performance began with C5 Corvette exhaust systems in 1998, followed quickly by systems for the C4 Corvette, Camaro/Firebird and the Viper. Featuring Dynamic Flow Technology (DFT), APEX series intakes unlock performance gains from your engine. Every APEX Series intake is system-matched with an oversized air filter to maximize air flow and reduce maintenance intervals. DryTech Part # 5160No Oil Air Filter: Washable and Reusable Part # 5160. - Each DryTech Filter Is System Matched to CORSA Performance Intake Components For Maximum Gains. - Features CORSA's DryTech 3D, Re-Usable, No Oil, Low-Maintenance, Air Filter. PowerCore Filtration Technology uses advanced technology for improved efficiency. Manufactured by Donaldson, the filter optimizes engine performance by directing air through specifically designed channels that allow clean air to efficiently enter the engine. Pro5 Closed Box Air Intake System; For Use w/Filter PN;. Filter Optimizes Engine Performance By Directing Air Through Specifically Designed Channels That Allow Cool Clean Air To Efficiently Enter The Engine. Protection Type :Air Box. Air Intakes Are Fast And Easy To Install. This CORSA Performance Pro5 closed box air intake is designed for 2015-17 Mustang EcoBoost 2.3 models. Featuring Pro-5 Filtration Technology, CORSA air filters are warrantied for 1 year, unlimited miles. Featuring Pro-5 Filtration Technology, CORSA air filters are warrantied for 1 year, unlimited miles. CORSA air intakes are proudly designed, engineered and manufactured in the USA. CORSA air intakes are fast and easy to install with detailed instructions and necessary mounting hardware included in every kit. This Corsa Exhaust Pro-5 Cold Air Intake uses a black plastic tube and blue Pro (R) air filter. Part #: 415864. Pro5 Shielded Box Air Intake System. Pro5 Shielded Box Air Intake System; For Use w/Filter PN;. Automotive products at CORSA Performance began with C5 Corvette exhaust systems in 1998, followed quickly by systems for the C4 Corvette, Camaro/Firebird and the Viper. CORSA Performance Cool Air Intake: PowerCore Filtration Technology uses advanced technology for improved efficiency. Manufactured by Donaldson, the filter optimizes engine performance by directing air through specifically designed channels that allow clean air to efficiently enter the engine. Corsa Pro5 Shielded Box Cold Air Intake for 2009-2014 CTS-V Sedan, 2011-2014 CTS-V Wagon and 2011-2015 CTS-V Coupe 6.2L V8 415864. Authorized Corsa Dealer - Factory 1 Year Warranty Included. Automotive products at CORSA Performance began with C5 Corvette exhaust systems in 1998, followed quickly by systems for the C4 Corvette, Camaro/Firebird and the Viper. This intake was designed in conjunction with our exhaust systems to increase your vehicle's performance. Automotive products at CORSA Performance began with C5 Corvette exhaust systems in 1998, followed quickly by systems for the C4 Corvette, Camaro/Firebird and the Viper. Shielded Box Air Intake System. Manufacturer Part Number: 46861. Pro5 Closed Box Air Intake System. Pro5 Closed Box Air Intake System; For Use w/Filter PN;. Automotive products at CORSA Performance began with C5 Corvette exhaust systems in 1998, followed quickly by systems for the C4 Corvette, Camaro/Firebird and the Viper. PowerCore Closed Box Air Intake System; For Use w/Filter PN;. Shielded Box Air Intake For 2012-2017 Jeep Grand Cherokee SRT 6.4L V-8. Corsa Performance Entered The Exhaust Category In 1998, Re-Writing The Rulebook For What A Performance Exhaust Should Be With The Launch Of Our Revolutionary RscÂ® (Reflective Sound CancellationÂ®) Technology. 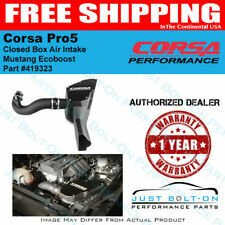 This Corsa Performance Pro5 Closed Box Air Intake System is designed to fit 2011-2014 Mustang GT 5.0L V8. Featuring Pro-5 Filtration Technology, CORSA air filters are warrantied for 1 year, unlimited miles. CORSA Pro5 Shielded Box Air Intake System with Pro5 Blue Filter. 2009-2014 Cadillac CTS-V Sedan 6.2L V8. 2011-2015 Cadillac CTS-V Coupe 6.2L V8. 2011-2014 Cadillac CTS-V Wagon 6.2L V8. - Closed Box Minimizes Hot Air From Entering The Engine. PowerCore Closed Box Air Intake System. PowerCore Closed Box Air Intake System; For Use w/Filter PN;. Maintenance Free Donaldson PowerCore Filter. Automotive products at CORSA Performance began with C5 Corvette exhaust systems in 1998, followed quickly by systems for the C4 Corvette, Camaro/Firebird and the Viper.